Before the advent of written Scandinavian history, the Danes and Swedes were launching raids and settlements Eastwards across the Baltic. The reason for these warlike activities was wealth in the form of amber and furs which were looted or taxed from the Finns, Wends, Slavs, and others living in the eastern Baltic region. Russia experienced only scattered raids until ca. 850 AD. The first evidence for this movement eastwards into Russia comes from the biography of Bishop Anskar of Hamburg written by his successor, Rimbert, who tells of how the Swedish king Olaf of Uppsala sent an army to punish rebellious Kurlanders and opportunistic Danes at Apulia in Lithuania. Shortly after there is a record in the Russian Primary Chronicle, a Scandinavian tribe called Rus appears, and by 859 they had begun taxing the Slavs and Finns. The pattern seems to have been that armed traders, having found a lucrative source of goods, established fortified bases with permanent warbands in order to protect their trade. As these prospered, they developed into settlements and finally trading towns. As areas became settled, the process continued further eastwards. Egils saga skallagrímssonar, tells how Egil and his brother Thorolfr travelled to Kurland for both trade and raiding. 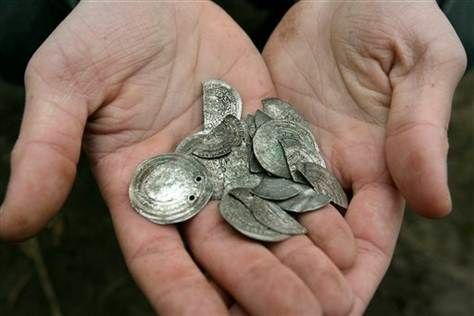 A major incentive for this activity was Arabic silver coins. The Islamic world provided the silver from mines in Tashkent and Afghanistan. After the fall of the Roman Empire, Scandinavia had no source of silver apart from what could be taken in raiding, or from the Islamic trade. Trade through Russia was difficult and dangerous because of the hostile Slavic tribes, so that traders had to be warriors as well as merchants. The river routes were also difficult, often involving portages around rapids, or waterfalls. These portages involved unloading the ship and transporting the ship and the goods around the obstacle. One often-used route had thirteen portages along its length.